The DCS50 is set up at the factory to run right "out of the box", but the DCS50 does have several operational options that you can use to customize the perfomance of your railroad. It should be noted that: Most customers never have any need to change these options. 1. 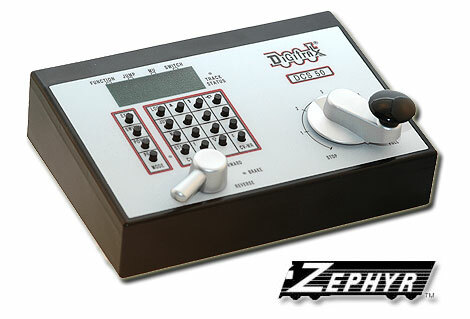 See the DCS50 Option Switch Table that follows to decide which option switches you want to change. 2. Press the PROG key. The display shows the last decoder programming mode used by the DCS50. 3. Press the SWITCH key. The display shows the last switch used by the DCS50 and its commanded position. 4. Use the numeric keypad to enter the number of the Option Switch you want to change. 5. Press the c/- or t/+ key to set the OpSw to the setting desired. 6. Press EXIT when finished. The DCS50 display will show -cS- to indicate that you are running in command station mode or -br- to indicate that you are running as a booster/throttle only. If you change option switches and experience unexpected results, just set OpSw 39 to “c” (closed) to reset the unit to the original factory settings. The following table shows the effects of setting various option switches. The factory settings for all DCS50 option switches are noted in the right column.